Financial management is the heart of project delivery, so why do so many people get it wrong? Sure, there are some projects that have to be done for regulatory reasons, and there will be a small percentage of initiatives that fall into the speculative category, but sooner or later the projects an organization delivers have to generate a return on investment (ROI). The old adage is that we manage what we measure. If we aren’t measuring financial information properly, how can we hope to manage our investments effectively? 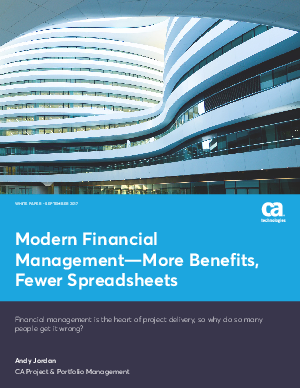 To learn more about how CA Project & Portfolio Management supports financial management, download today.